Home � Meagher , politics � Sweet butter crumpets! What happened in America? Sweet butter crumpets! What happened in America? So, how could he win so decisively? If you exclude crazy California, he won by about 2.5 million votes. Since Canadians are up here and Americans are down there, we get most of what is going on from the mainstream news media. So, the better question is how could journalists, who are so shocked and apoplectic, be so disconnected from everyday Americans? It might come as a surprise to Canadians but big media journalists on both sides of the border are generally left-wing. But Canadian journalists are even more so and to many of them a centrist position is right-of-centre and right-wing is fringe. I stopped hiring summer students from the Carleton University journalism program years ago when I found them closed-minded and antagonistically left-wing. I mentioned this lack of objectivity to a Carleton faculty member and she replied: “Our students work very hard and in their research have found that the truth is left-wing.” At least she was honest about their tilt. To be accepted by their peers, the vast majority of journalists typically slide into the left-wing default position on most ideas and have done so for years. Former CBS producer Bernard Goldberg wrote that news rooms across the United States are filled with people who think to the left, surround themselves with people who think to the left and, therefore, assume the correct answer is to the left. And that was in 1994. When it comes to religion, Trump got a big boost from those who attend a religious service at least once a week. Clinton’s biggest support came from those who do not attend any religious service at all. A study found that among a large group of professionals, journalists were among the least likely to have any religious affiliation. Journalists and Clinton supporters are practically kindred spirits. Not surprisingly, when the Media research Centre looked at 12 weeks of evening news media coverage on the big three TV networks (ABC, CBS and NBC) it found that in covering Donald Trump, 91 per cent of the news reporter coverage was hostile: they made 623 negative comments. 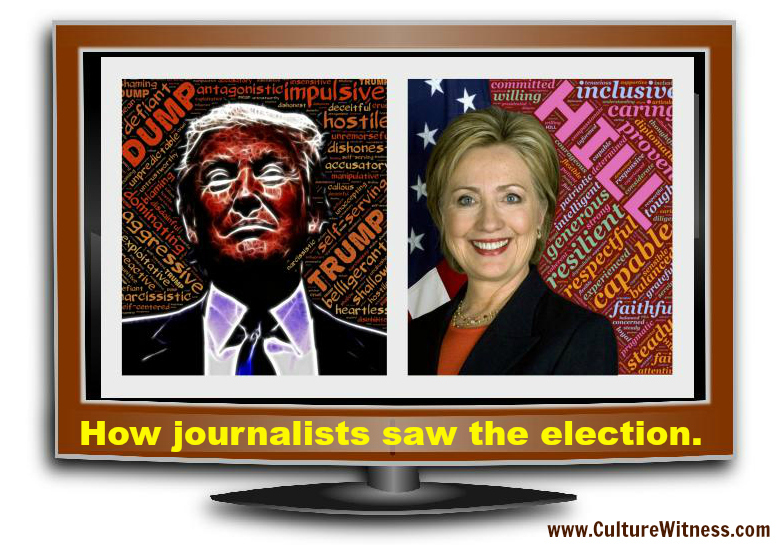 Over the same time period, news reporters offered 145 negative statements about Clinton. Heap on the negatives and you get a man who is unpresidential. But what exactly makes one unpresidential? Do the Clinton scandals make her unpresidential? How about the Whitewater scandal (others ended up in jail), Bengazi (killed four Americans), the email scandal (FBI conceded it would have sent anyone else to jail), the Clintion Foundation (got rich on donations from foreign countries in a trade for political favours), her husband (sexually assaulted women)? How many people remember reading how a Russian company paid Bill Clinton $250,000 for a speech, while his wife was secretary of State and granted the Russians a huge chunk of Uranium rights on U.S. soil? That might be treasonous. Does it also make her unpresidential? To half of America, yes. Big media needs to rethink its criteria. I agree with Newt Gingrich that if the news media treated both candidates equally, Donald Trump would have won by a landslide. Had he been treated like Clinton, he would have received his interview questions ahead of time. He would have been able to edit articles about himself before they were published. He would not have faced a barrage of interruptions and follow-up questions in the debates and would have been characterized as having “misspoken” when he gaffed. His remarks would have been sanitized and polished, rather than distorted and demonized. Trump supporters were also demonized. What does that make brain surgeon Dr. Ben Carson? Or the many law enforcement groups that endorsed Trump? Or the inner-city black leaders who wanted a return to law and order? His supporters included half of all white American women. Are they also stupid? The reality is they are sick of betrayal from career politicians. They are willing to live with a flawed character because they agree with his main policies. Trump is an idea man. He’s filled with ideas and has a track record of getting things done. His buildings are all over America. Building a wall between Mexico and the U.S. is such a good idea that countries like Hungary and Israel built their own walls to keep illegals and criminals out. On Muslims, Trump wants to stop immigration from Muslim countries that breed terrorists until the United States can figure out how to stop terrorists at the border. That has proven to be wildly popular. Isn’t safety and security job one of any country’s leader? Trump wants to drop corporate taxes and allow for a one-time free movement of assets back to the United States for companies that left and took good jobs with them. That’s a job generator. Isn’t the hope for a good job what many Americans want? The news media owes the world a huge apology for encouraging millions of people to hate the caricature that it created. Meantime, President-elect Donald Trump has four years to prove to the haters that he’s not the villain that the news media painted him to be. We provide commentary on the cultural decline of the Western world, from a conservative perspective. Culture Witness was created to give a voice to those who have learned to stay silent. Culture Witness will publish articles, reflections and observations by ordinary citizens. If you have something to say, but have never published anywhere before, consider Culture Witness. Because of the times we live in, we permit the use of pseudonyms. You must submit your piece under your own name, but you can then choose to publish it under an alias (the same alias for all your pieces). Words have power, because truth has power. It has the power to change minds and to stop dictatorships in their tracks. We believe it is important to keep the dialogue flowing, and the light of truth glowing. The fear of repercussions must not silence free and democratic discussion in our society. Submit your opinion piece to the editor at: editor@culturewitness.com. Proceeds go to marketing, domain name hosting, web development and maintenance.